I discussed with my daughter about making a surprise for her mother. Oh, my little Ilonga (girl coming from Iloilo province) I thought, you still live in the Philippines. Who cooked the pansit? Wow, a very Filipino food! 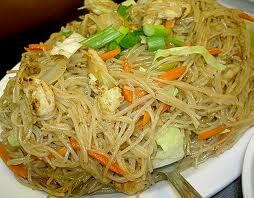 A symbol of long life and endurance…enjoy the pansit! Good eve fr! Yes it was Sara who prepared the pansit earlier, she gave it to the youth org here in our church. They had a Filipino evening w pansit and karaoke. A very complete evening! With good pansit of course!